A conversation with Alice Rossiter. Ashley McAdams, Editorial Director at Rockets of Awesome. When we hear “at-home entrepreneur business”, we have visions of Facebook “friends” hosting “parties” where you’re forced to buy “amazing” skincare products or jewelry. Nothankyouverymuch. But Alice Rossiter is turning the model on its head. 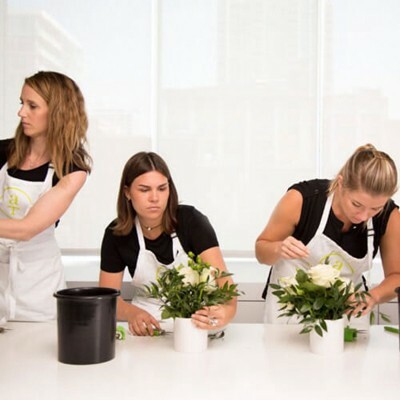 Alice’s Table is a chic flower-arranging event business that offers women (and men if they like!) the opportunity to launch a career that’s flexible, sustainable, and most importantly — doesn’t require them to push product on their friends. No, you don’t have to have a floral background. No, you’re not about to see a million invites pop up in your Facebook feed. And no, there is no weird pyramid scheme. We peppered Alice with questions. Read on for all the flowery details… Warning: You might want to quit your job afterwards. This is an elevated brand with high standards, so it’s no surprise the application process is rigorous. First is an extensive online survey, which determines whether you’ll make the next round — a video interview. The video interview gives applicants the opportunity to show how personable and outgoing they are, as hosting chops are key to being a successful Alice’s Table event host. There are currently 10 hosts in 3 states. Since the business revolves around teaching a skill, training is key. Theirs is a 4-phase process: After each phase, you meet with Alice. She asks a few questions (no one has failed yet! ), but it’s more a conversation where she helps you brainstorm event ideas, collaborations, and the right strategy for your business. Each season, Alice’s Table provides 15 floral events for hosts to choose from (think flower crowns, succulent gardens, holiday wreath making), but you also have the option to get creative and come up with ideas of your own. One host recently came up with Roses & Rose where she partnered with her local wine store who provided a flight of wine for an additional $15 per ticket (and emailed their customer base to get people to attend). A sommelier came and talked about each wine as they sipped and made rose bouquets. Getting started will cost you about $1,500, which covers training, access to the tech-forward platform that manages everything seamlessly (event creation, ticket sales, marketing, etc), and all the materials (aprons, clippers, etc) for a 30-person event. The technology for Alice’s Table is set up so there’s a community amongst hosts, so you can communicate, share ideas, and support one another. You can also find other hosts in your area and throw events together. Unlike other at-home businesses, the pricing is clear and simple (no pyramid schemes here). Alice’s Table takes 30% of your ticket sales, so you get 70%. Tickets are a flat $65/person, and there’s nothing to sell them at the events. Hosts pay for flowers, which are around $22 (available through their platform or you can source yourself). We won’t make you do math: If you host 240 people per month, after flowers and pre-tax, your take-home is $67K per year. If you’re not comfortable asking friends to attend an event, no problem! They will help you host things like community or corporate events. And collaborations are another option: They have one set up with Jonathan Adler quarterly where a special vase is used and the stores reach out to their customer base for attendance at the event. This is a truly flexible opportunity. There are no quotas. The number of events you do is your choice, depending on whether you want to make a full-time thing or just want a fun way to bring friends together a few times a year. Originally published at news.rocketsofawesome.com on September 6, 2016.